David Byrne performed in Auckland at ASB Theatre - Aotea Centre last night, 14th Feb 2009, as part of his "Songs of David Byrne & Brian Eno" world tour. I loved the show. 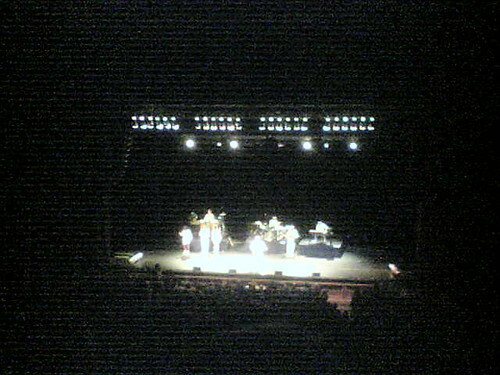 The musicians, backup singers and David Byrne all wore white. 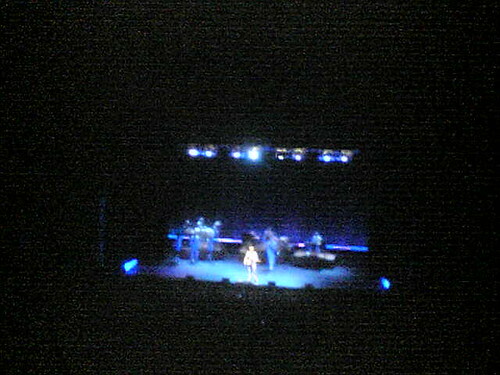 The lighting was a series of subtle background colours changing for effect in different songs. Byrne chatted with the audience who shouted comments to him & showed their appreciation with loud applause. There were three dancers who acted out the songs - at times Byrne was the fourth dancer. The show was very theatrical as the story of the music, lyrics and movements of the dancers weaved together. 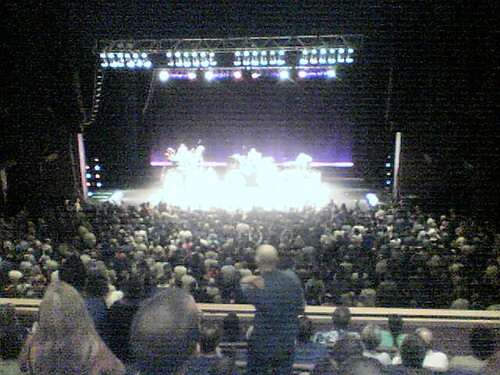 The audience was generally an older crowd - mid 30s - 70s from my estimation. The show was sold out. They played a range of songs, from Talking Heads, his earlier collaboration with Brian Eno, "My Life in the Bush of Ghosts", and the latest album "Everything that happens will happen today". Another favourite part of the show for me was watching the audience enjoy it so much! I watched one man in his 60s dancing in his seat, shoulders moving, fingers pointing in all directions to the percussive beats. 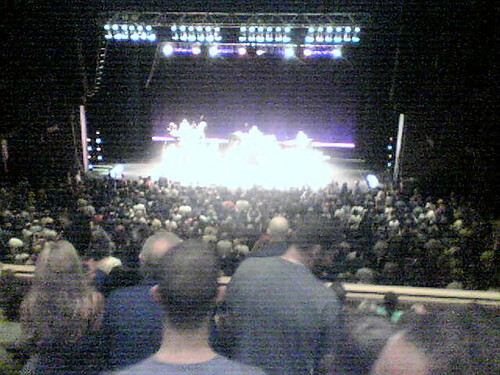 Others were dancing in the aisles and along the edges of the rows of seats. Some even danced similar to people at an outdoor party - I recognized some of the same dance moves - I'm sure they would have been as comfortable dancing under the stars to his songs. What a concert that would be! unfortunately I didn't take my good camera & the signs at the venue said no photography but others seemed to be taking flash photos during the performance. so these are just quick (no flash) phone camera photos to trigger my memory. amazing concert! !